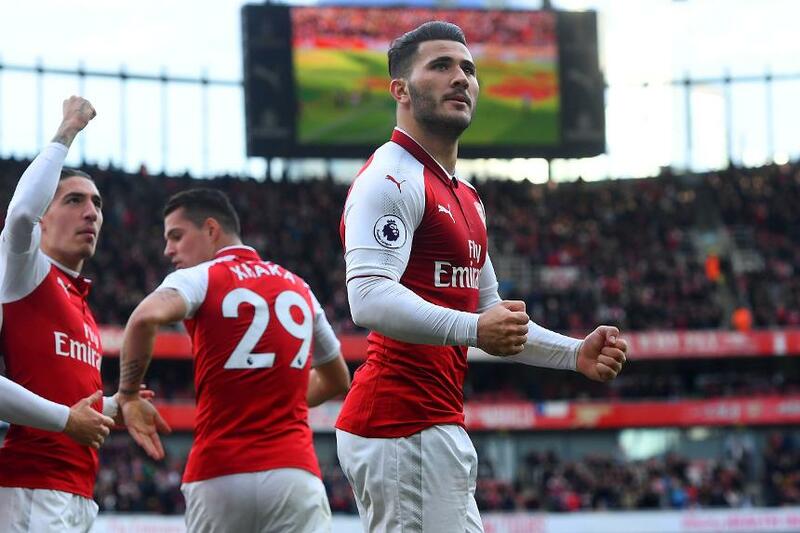 A defender topped the Fantasy Premier League scoring charts for the fourth time this season in Gameweek 10, with Sead Kolasinac (£6.0m) leading the way. The Arsenal wing-back figures in a 4-5-1 formation, as the premium-priced forwards go missing. Pope's clean sheet against Newcastle United was his third in six starts. His 31 saves have earned seven additional points, along with six bonus points in that run, more than any other goalkeeper for both. The centre-back beat his goalkeeper to the maximum three bonus points against the Magpies thanks to 15 clearances, blocks and interceptions (CBI). No FPL defender has had more shots in the opposition penalty area than Mee (nine) this season. 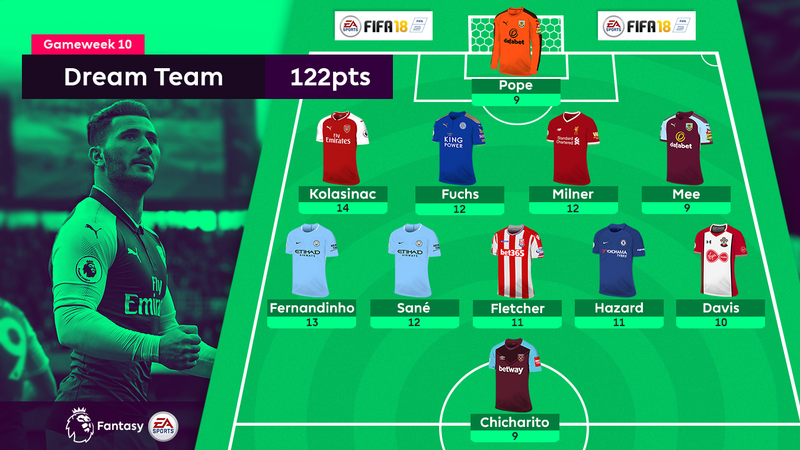 A first assist of the campaign helps the Austrian earn a Dream Team bow for 2017/18. Fuchs supplied four assists in each of his previous two seasons, and his deliveries from the left flank could be vital for new manager Claude Puel. Classified as a defender this season, Milner’s prospects have been dented by a lack of starts. But a second successive appearance ensured that he earned a first assist and maximum bonus points against Huddersfield Town in Gameweek 10. The Bosnian’s 14 points arrived from a goal and an assist, underlining his growing potential as an attacking force from wing-back. Only team-mate Hector Bellerin (£5.9m) has had more touches in the opposition penalty area among defenders this season (39 to 32). The Brazilian struck a second goal in three Gameweeks in the win at West Bromwich Albion, while his assist means he has two for the season, one more than in 2016/17. A cut-price route into Pep Guardiola’s midfield, Fernandinho will still likely be ignored in favour of big-scoring alternatives. Sane is one such alternative in the Manchester City ranks. He matched Fernandinho’s goal and assist at The Hawthorns and takes outstanding form into the Gameweek 11 home meeting with Arsenal. The winger has produced double-figures in each of his last four Gameweek fixtures at the Etihad Stadium. The midfielder matches last season’s Dream Team count by earning his first appearance in 2017/18 thanks to 11 points in the win at Watford. A goal and a Gameweek-high eight key passes gave the winger maximum bonus points from Chelsea's win at AFC Bournemouth. Hazard is hinting at a return to his best, and N’Golo Kante's (£5.0m) return to fitness could allow him to be deployed in a No 10 role from Gameweek 11. The midfielder is the first Southampton player to earn a second call-up to the Dream Team this season after his goal in the 1-1 draw at Brighton & Hove Albion. No player scored more than one goal in Gameweek 10, with Chicharito the only forward to collect maximum bonus points. His opening strike in West Ham United's 2-2 draw at Crystal Palace was just his second goal in eight Gameweek appearances.